The ThinkPad X1 tablet could have copied the Surface Pro 4 and called it a day, but instead it built in more versatility. Lenovo’s new ThinkPad X1 Tablet takes the Surface Pro 4 concept and does it three better: Thanks to optional accessory modules, you can add clever new tricks to this otherwise familiar-looking 2-in-1 Windows PC. The $899 ThinkPad X1 also debuts with USB-C ports that can handle power, data, and video. The kickstand unfolds gently from the back of Lenovo's ThinkPad X1 tablet. The ThinkPad X1 starts as an 8.4 mm thin, 1.75-pound tablet that fattens to 13 mm and 2.4 pounds total when you attach the included keyboard. This is basically a Surface clone, but arguably with a much better standard keyboard. 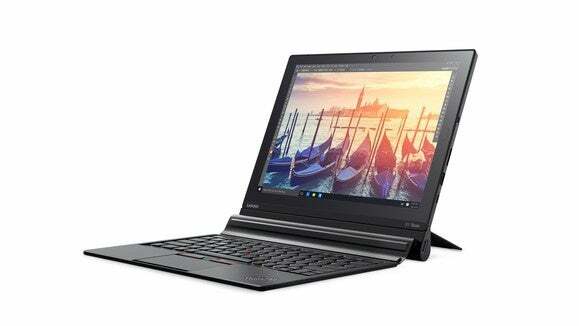 And even when unadorned with extra modules, the ThinkPad X1 offers impressive specs. Optioned to the hilt, you get a sixth-generation Intel Skylake core m7 vPro CPU; a 1TB PCIe NVMe SSD; and 16GB of LPDDR3 memory. The 12-inch IPS display offers a crisp screen resolution of 2160x1440. This tablet isn’t messing around. 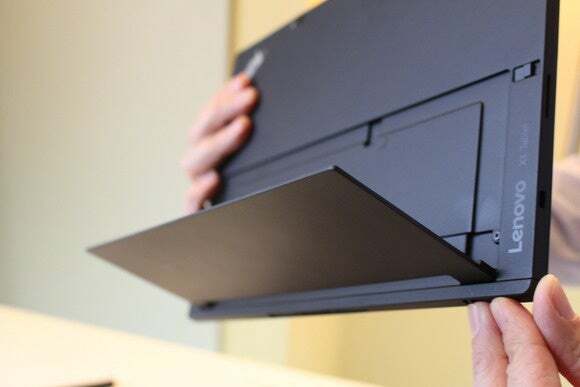 The three available modules snap onto the bottom of the Lenovo ThinkPad X1 Tablet with sturdy flaps. But here’s the fun part: Add any of the three optional modules, and suddenly you have a hybrid with extra talents. 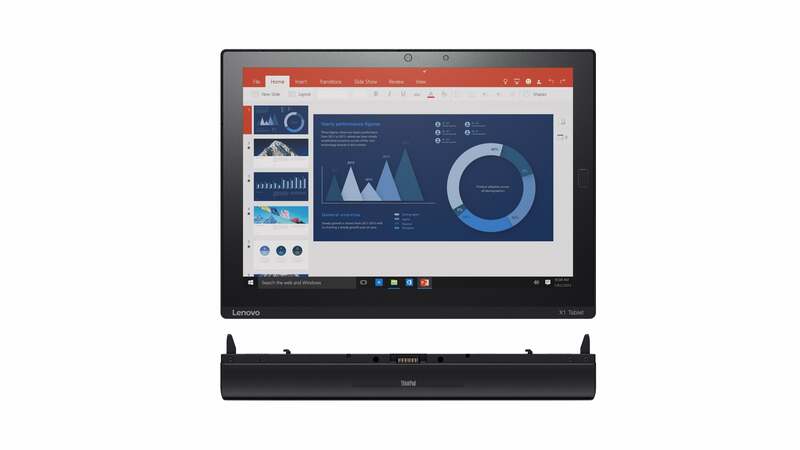 The Productivity module ($149) adds 5 hours of battery life, a USB 3.0 port, a full HDMI port, and a Lenovo Onelink docking connector. The 3D Imaging module ($149, coming in May) brings a rear-facing Intel RealSense camera and full HDMI. 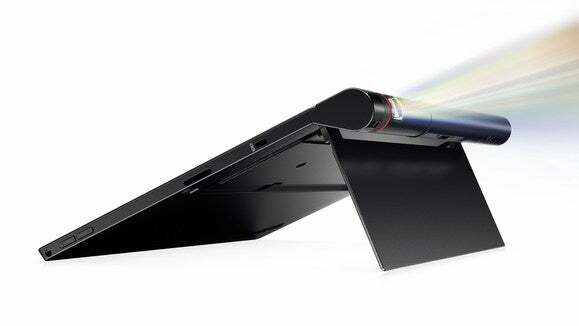 Lenovo's ThinkPad X1 Tablet is shown here with the 'Presenter" module, which includes a miniscule 720p DLP projector. My favorite is the $279 Presenter module, which adds a tiny Pico projector and HDMI in/out. I’ve long envied this fun and handy feature on Lenovo Yoga Android tablets, but there’s no love lost for lugging full projectors on business trips. 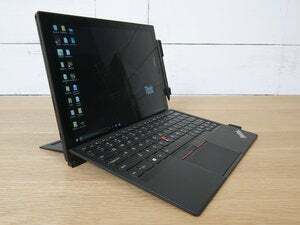 The Lenovo ThinkPad X1 Tablet could have been any other Surface clone, but the switchable modules add battery, a projector, or a 3D camera to the base tablet/keyboard hybrid. Another bonus: The USB-C port will handle power and video, as well as data. This is a pain point for early adopters of USB-C products, as port features vary and the standard continues to develop. 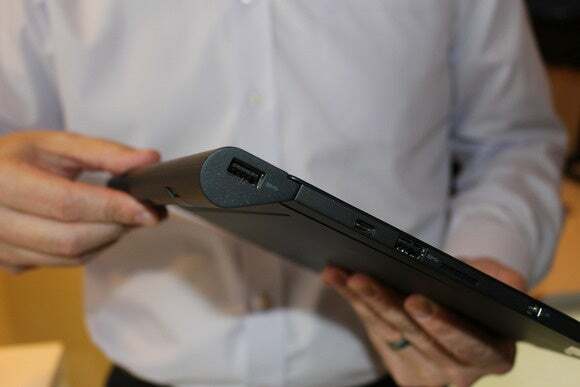 The entire new ThinkPad line introduced at CES will have fully functioning USB-C ports, but it’s worth noting that Lenovo’s consumer products with USB-C may have more limited port functionality. Lenovo’s ThinkPad X1 Tablet gives Surface shoppers something to think about—a competitor that that brings fresh new features to the mix. We look forward to seeing more Surface clones push on the concept during CES.